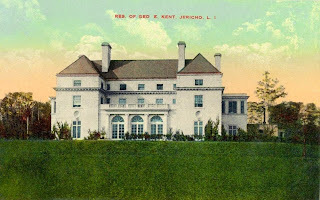 'Jericho House', the George Edward Kent estate designed by William Welles Bosworth c. 1906 in Jericho. Click HERE for more on 'Jericho House' which has since been demolished. From Zach's description in today's post I guess no one identified the architect of 'Jericho House.' Of the previous guesses I'd go with Carrere & Hastings ... although Stanford White is always a good default. I am going to guess the architect was William Wells Bosworth. Hey! Why did William Welles Bosworth suddenly win??? I've got more guesses; lots more. Ogden Codman -- there's another one. Thanks Zach. Now I'll venture to guess the house had to be torn down because the pipes in the walls were leaking. A builder does not make a substition like that for no reason -- my life's experience. I don't think that ruling is fair at all...the builder made a deal and should have stuck by it. The pipes were most likely the cause of this homes ruin. Most construction contracts, at least now have an "or equal" clause regarding materials. Seems the builder used a different supplier of piping, not a lower or higher grade of pipe, just where the piping was manufactured. Seems absurd to have to remove and replace it if it functioned properly and had the ssame guarantees. Cant imagine that the piping was the issue in this buildings eventual demolition, rather the close proximity of the house to Jericho Tpke, which became overrun with housing subdivisions after WWII. Very nice house and curved entry court though. trying to figure out exactly where this house sat. I don't find it on wikimapia - is it somewhere there? I’m going to take issue with Anon 9:47AM’s comment. I understand Jacobs & Young, Inc. won the case, claiming substantial performance. But you would be hard pressed to find two manufacturers who claim their product is identical to the other’s & who provide identical guarantees. There was a difference between Reading & Cohoes pipes, as I’m sure the sales reps at Reading & Cohoes would have been happy to explain. But even if they were identical I think that if the guy paying the bills puts such a specific requirement in the contract the builder has an obligation to at least inform that a substitution is being made … not let the customer find out after it’s, oops, too late. If I were longer winded I’d go into detail about having a bathroom remodeled & telling the contractor I did not want any pressboard in my house. It ain’t the same as wood. But I agree about it being a nice house. I bet the interiors were great.